Teachers had one more day of work on Monday to enter grades, pack up and check out. I took two (very short) naps on Tuesday. That’s usually my m.o. for the first few days of vacation, but this is a funny week. We had interviews yesterday for a new Math teacher on our team. It was good to be sitting on the other side of the table for a change. Today, I have part 2 of some Reading work we did earlier in May. So, really I’ve only had one vacation day this week. And yet, I have managed to get in some good summer reading. 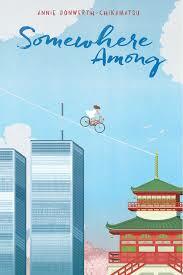 I finished Somewhere Among by Annie Donwerth-Chikamatsu, a story of a girl caught between two countries. Publisher’s Summary: A beautiful and haunting debut novel in verse about an American-Japanese girl struggling with the loneliness of being caught between two worlds when the tragedy of 9/11 strikes an ocean away. This is a lovely novel in verse that bicultural kids would understand on a personal level, and kids who aren’t bicultural will find eye-opening. Although the format makes this a quick read, it is not an easy read. Some one sentence chapters pack a huge emotional punch. This was a wonderful way to start my vacation.